The smoky, full BBQ flavor in each bite will leave you wondering where we hid the grill. 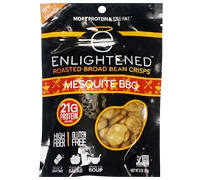 ENLIGHTENED Mesquite BBQ Roasted Broad Bean Crisps are now available! The best-kept secret in healthy snacking! Enjoyed around the world for their delicious flavor and satisfying crunch, broad beans are a nutrition powerhouse packed with protein and fiber. ENLIGHTENED CRISPS are lightly roasted in sunflower oil, sprinkled with sea salt, and seasoned to perfection. So go ahead... spill the beans.